When we leave the sheltered idealism of college and enter the pragmatic, money-driven world of employment, we're often jolted by the disparity between the two. We quickly discover what we've learned in our classes, what our professors drilled into our heads, and what we studied for our exams don't hold much weight in the real world where profits mean more than philosophy and outdoing the competition trumps doing what's right. This dramatic difference between what's taught at college and what's applied in the work world is most pronounced today in the field of early childhood education. Here, college students learn one thing in their classes and must do nearly the opposite when they get hired to work at a preschool. Not only are these graduates poorly compensated but they must forsake what they know is best for young children and do what's demanded of them by their bosses. It's often an untenable situation, leading to an extremely high turnover rate in the profession. Many of America's preschool owners have misrepresented the latest findings in brain research in order to turn a profit and stay competitive. When it was found that young children's brains rapidly develop connections called synapses during their first three to four years of life, some opportunistic owners began using this discovery as a marketing tool. They'd describe their preschools with words and phrases such as: enriched, stimulating, academically rigorous, brain enhancing, guided by the latest in neuroscience, and the ideal place to maximize your youngster's learning potential. They convinced unwitting moms and dads that a superior preschool should reflect the latest findings in brain research including workbooks, flashcards, computers, STEM lessons, teacher-directed learning, and foreign language instruction. The implied promise being that this would give their kids the competitive edge, turn them into geniuses, and guarantee a future with early admissions to MIT and lucrative careers in Silicone Valley. Patricia Wolfe sets the record straight about early learning and neuroscience in Brain Matters: Translating Research Into Classroom Practice. This brilliant book helped me build a developmentally appropriate curriculum for my students and gave me a research-based explanation for why it centered on play and not academics. I highly recommend it for all moms and dads, but especially those who are convinced that earlier is better when it comes to structured learning. Contrary to popular belief, Wolfe explains that the more synapses children make during their early years doesn't mean they'll become Einsteins. That's because youngsters “prune” synapses as they grow, trimming away the ones they don't need. As Wolfe contends, children have all they need to learn within themselves—an innate curiosity, a robust imagination, and an intense desire to explore the world around them. They don't need teachers to “fill them up” with knowledge like most preschools in the United States do today. They don't need the latest technology, overpriced STEM sets, or elaborate phonics programs to get the upper-hand. What preschoolers need most are plenty of opportunities to interact with one another, investigate their environment (both indoors and out), and have warm, loving teachers to support and guide them. Much to the detriment of children's learning, play at America's preschools has became synonymous with wasted time. 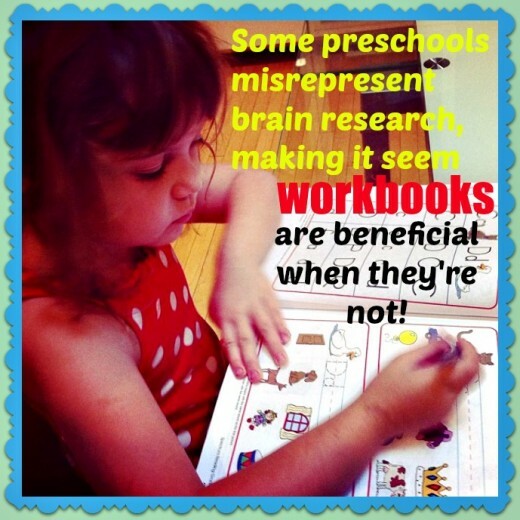 Too many uninformed moms and dads see it as frivolous and instead demand “real learning”—workbooks, circle time, science projects, and alphabet activities. They want results: youngsters reciting the days of the week, recognizing patterns, tying their shoes, counting to 100, and knowing their letter sounds. They're interested in these narrow skills because they want their youngsters prepared for kindergarten. In the process, however, the broader (and far more important) skills that prepare them for life are now minimized. While many preschool owners in the United States give lip service to the importance of play, they buckle under pressure and give into parents who demand academic rigor. As a result, teachers are no longer emphasizing the "big picture" skills that were once the foundation of preschool: getting along with others, working as a team, solving problems, exploring new materials, dealing with conflict, developing curiosity, being persistent, and dealing with failure. To stay in business and keep moms and dads satisfied, preschool owners now offer academic activities that are not only developmentally inappropriate for young kids but have long term negative consequences. In Taking Back Childhood (a book I frequently recommend to parents who want academic rigor for their preschooler), Nancy Carlsson-Paige makes the case that preschoolers learn best through play. She decries our country's obsession with testing young children, assessing them, lecturing them, filling them with information, and pressuring them to learn too much too soon. She celebrates play as the way children express their creativity, solve their problems, soothe their souls, and build their friendships. I now give this marvelous book to anyone I know who's expecting a baby. 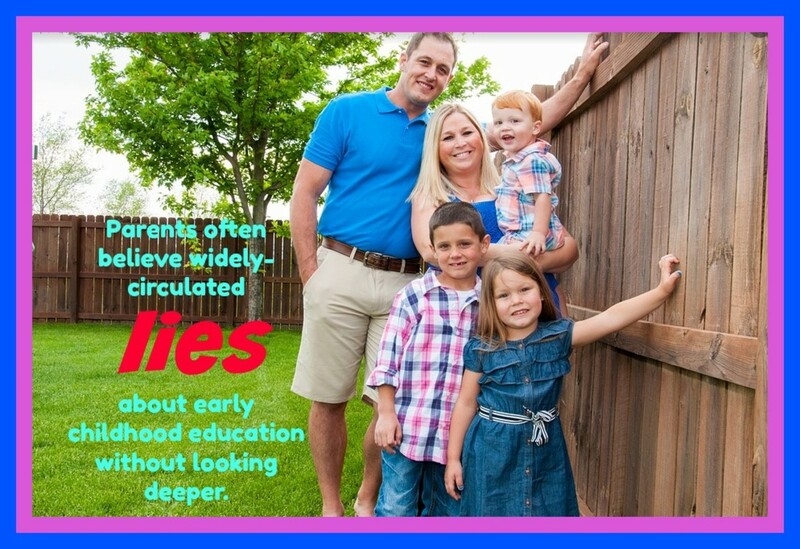 It helps moms and dads see early childhood education in the proper light and not get caught up with today's ridiculous quest for academic rigor. While visiting preschools around the country, Carlsson-Paige talks about how her heart breaks when she sees too many kids already disenchanted with the education system and turned off to learning. She comments, "When children are taught things that they're not ready to learn, it can create feelings in them of confusion, anxiety, and inadequacy." Through her decades-long career in early childhood education, she knows that youngsters learn best through purposeful experiences in the real world, plenty of time for play and exploration, and fun interactions with both peers and adults. 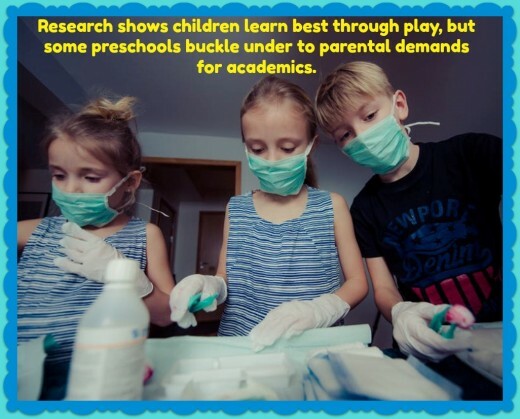 Research shows that play at preschool is not wasted time that could better be spent on academic activities. Rather it's a hugely significant developmental step in acquiring reading and literacy skills. A youngster who builds a strong vocabulary at preschool—learning to use and understand a host of new words—is more likely to become a competent reader, writer, and speaker as all three of these abilities are intertwined. Unfortunately, some preschool owners are remiss at communicating this crucial information to parents, leaving them to falsely believe play is just fun and frivolous and nothing more. If you visited preschools in America today, you would get the impression that teaching pre-reading skills—the alphabet, letter sounds, and rhyming words—is the most pressing goal. You'd see the alphabet displayed prominently on the wall. You'd see a bulletin board with the words “letter of the week” surrounded with pictures of things that start with that letter. You'd see kids practicing their letters in handwriting books and putting together puzzles about rhyming words. You'd see the teacher saying the letter sounds and having the youngsters repeat them after her. You would sense a real urgency about getting kids prepared to read as if it would guarantee life-long lovers of books. In reality, however, this is far removed from the truth. To develop early literacy skills in young children, preschools need multiple dramatic play areas such as a kitchen where kids can pretend to be chefs, a veterinary clinic where they can pretend to treat sick animals, and a landscaping business where they can pretend to work with plants, gardening tools, and rocks. This is the kind of rich interactive environment where vocabularies flourish and communication skills are strengthened. As children ask each other questions, discuss and debate, and learn the value of nonverbal cue, they become more powerfully literate. Dramatic play is far more valuable (and fun) than anything a teacher can say or do at circle time. America's preschool owners are either misrepresenting or misconstruing the latest research about how best to promote pre-reading skills to young children. 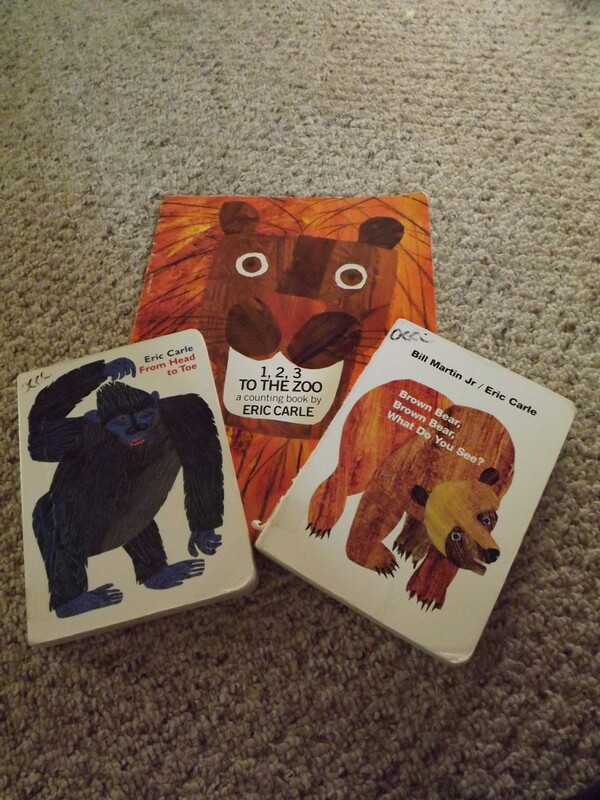 Numerous studies over the past twenty years have clearly shown that children's phonological awareness (their ability to identify and manipulate individual sounds in spoken words) is key to becoming competent readers. With that sound bite of information, though, some preschool owners have wrongly justified an over-the-top use of materials that teach phonics: workbooks, computer programs, board games, puzzles, flashcards, audio tapes, and expensive phonics kits. Today, many preschool teachers now give daily lessons in phonics during circle time, saying the letter sounds and having the class repeat them. Based on the research, this is meaningless to kids, boring, and unnecessary. In Building the Reading Brain (written over a decade ago), Patricia Wolfe and her co-author, Pamela Nevills, strongly warn against what has now become a tragic reality —the “pushed down” curriculum where what was once taught in first grade is now taught in kindergarten and what was once taught in kindergarten is now taught in preschool. They write that today's “earlier is better” approach is “based on a lack of understanding of the reading process, of children's brain development, and of the types of activities that are best suited for different ages.” They argue that linguistic awareness is best fostered in an organic way at preschool and at home by reading poems, stories, and nursery rhymes, singing songs, listening to children's music, doing cooking and art projects, and having plenty of time for imaginative play and social interaction. 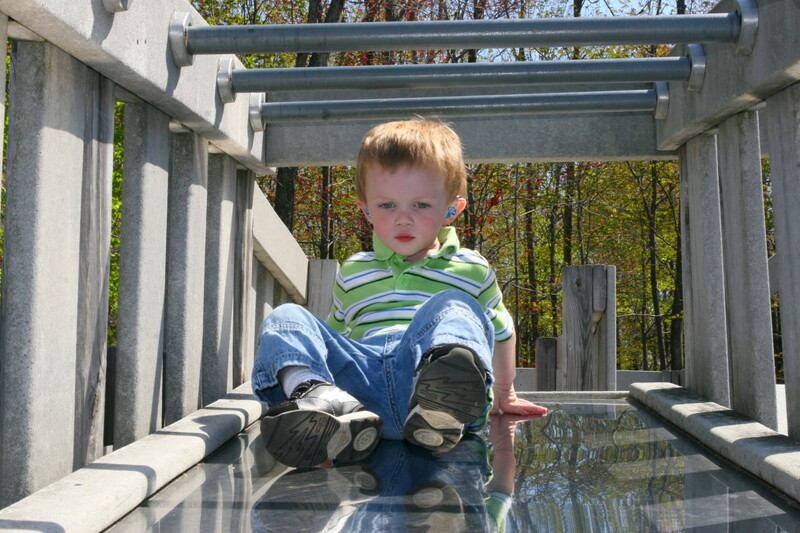 Thus, children's brains don't need to be overloaded with information during the first five years of life. 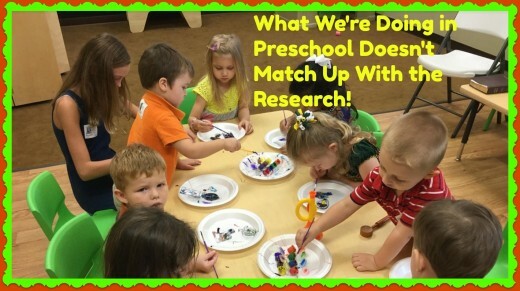 The practice of doing so at America's preschools represents a huge distortion of the research. It doesn't make kids any smarter, turns them off to learning, and limits their creativity and potential. Thanks for your kind words, Dora. Sometimes the same thing is said over and over and begins to be accepted as fact. This is the case with teaching reading in preschool and kindergarten. Too many people see it as progress when it's really a big step backward. 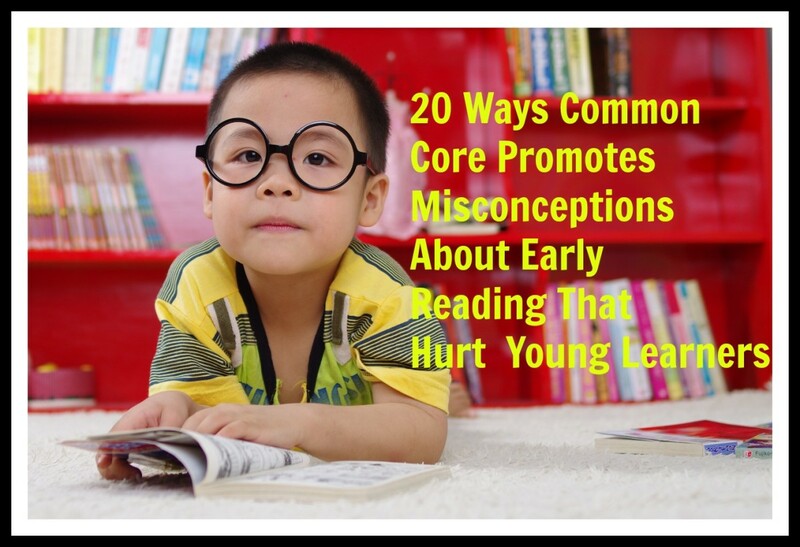 Parents love to brag about having an early reader but, in the long run, it means nothing. You've given us much to think about. The educators and parents have to cooperate in the interest of the children; and their approach must be honest and child-centered for their all-round development. Thanks for bringing these errors to our attention. Thanks for your kind words, RTalloni. I had just gotten fed up with the wave of anti-intellectualism, anti-research, and anti-professionals in our country, especially in regards to early childhood education. Too many parents are wildly impressed by all their children are learning in preschool and kindergarten as though it will translate into future academic and career success when it won't . Countries like Canada were heading down the wrong track of academic rigor in preschool as well but turned it around. Hopefully, we'll do the same. In the meantime, more children are suffering from depression and anxiety and a lack of play seems to be a major factor. VIva "taking back childhood"! Bravo "the most powerful learning"! Good for you for speaking up on behalf of little ones! What has happened to so many children via the so-called early education movement is sad business. Home education is mocked, but it can be a great option for parents/grandparents who want to break out of the "meaningless, boring, and therefore, unnecessary" mold the education system tries to pour them all into.